At last. India wins an individual gold medal. After 112 years. Screw ace-swimmer Michael Phelps and his quest for 8 individual gold medals. Woh kya jaane ek gold ki keemat. And in this golden moment, when we as a nation step from an old age to the new, it is time to remember those who made this achievement possible and express our sincerest gratitude to them. The maid servant in the Bindra family who allowed herself to be used as a human target for seven-year old Bindra’s air gun. I congratulate myself and every other Indian. How could Bindra have motivated himself had not Gill’s Sports ministry deliberately put adversity in the path of the shooting team (after all what’s a sporting story without insurmountable odds) by stopping the procurement of ammunition, a decision that pushed the shooting team to declare its intention to boycott the games out of desperation since they had been reduced to shooting with blanks? And how could Gill have flapped his gills if we, the people, had not elected the Congress in the first place? In Chandigarh, everyone is aware that my wife, who was the director of sports, contributed a lot to the development of the shooting range in the garden city. And what to say about our chef d’mission Murugan who, through his inspired leadership, has earned the title of “Quick gun” Murugan especially the alacrity with which he and the other officials kicked out Monika Devi of Manipur for failing a drug test that she actually had not failed, in the process triggering of a political crisis. After all, what’s an athlete here and there as long as there are 42 official officials (the number of “unofficial” officials is close to 100) all tagging around, burning tax-payer money, money that was supposed to be invested in athletes and equipment. And not to forget the super-officials, officials who rule the officials and in the darkness bind them, taking important decisions like which head-honcho gets the window seat and discharging the onerous responsibility of informing the press as to why Sania Mirza was not in a sari. “Zhu zhu zhu. Yasodha ka nandlala” Zhu Qinan who lost the gold to Bindra. Yes let us thank this man too. Or more accurately express our deepest sympathies. It’s not everyday that one loses an Olympic Gold to an Indian. As a matter of fact, losing gold to an Indian is as rare an occurrence as being stuck by lightning twice and winning the lottery on the same day. But it happened to Zhu and as evidenced by his copious tears at the awards ceremony, he knows that the Chinese commissars are not going to be happy at the end of the Olympics when they do their performance evaluation. A loss to the US or Germany or the UK they understand. But India? Do not be surprised if a generation later, a young man is found walking around in Beijing with an arm that has tattooed on it, (“Deewar” style) the Mandarin message “Bam Chik Bum Bum” (for context read my post on Tahalka) which in Hindi means “Mera baap Indian se gold haara”. 1st this time atleast ? abhinav’s success proves that in India sportspersons can grow only if they are financially well provided for otherwise. I do not want to tke anything away from abhinav, becoz not every rich man’s son wins an olympic gold. But the poor sports infrastructure makes it difficult for everyone to participate in such pursuits. After all, a job in railways or punjab police offers more certainity and a steady pay check. The irony being BCCI playing Godfather and doling out 25lakhs to Abhinav. 5) franship and marriage proposals…. all i can say is that the relevance of Sohail Khan mind-melt “I proud to be Indian” has come out into the open…. nothing to take away from the young man but an influential daddy sure comes in handy. Great job done by this namesake of mine…. jokes apart…Abhinav Bindra has made our nation mighty proud…you are a rockstar man. Awesome.Dill khush kar ditta.Tainu ek Gold Medal dene ka man hota hai ji. Interestingly, both Qinan and Cao Yifei, another Chinese, are poorer to Abhinav Bindra. The facilities for them came from the government and the support from the people. This iPod thing is getting a bit stale now. GB, you come with some great titles for your posts. You remember Chitrahaar’s favorite song (Zhu zhu zhu …)! I’m great admirer of you. i’m confident that i’d be taking Rs 5 lakh to home as winner. Allow me take the challenge. the coverage by good old doordarshan brought a lump in my throat and tears in my eyes. it is yesterday once more.pure nostalgia. slow and easy commentry, weirdo anchors (the guy with the reading glasses and the morose one), the correspondents who are clerks at the corporation in their day jobs, socially uplifting messages by some sarkari department, unscheduled and unexpected breaks eg they cut off from aus vs brazil basketball game sixty seconds remaining in the last qtr. But thanks to them at least we are able to see the games. i understand that no private channel and sponsor will touch olympics with a pole. There might be quite a few unintentional only-one-person-in-the-hall screenings, considering the kind of movies RGV is making. Seriously Phelps kya jaane ek medal ki kimat! Awesome post as always. The Bum chika bum bum bit was hilarious 😀 And Congrats Arnabda! Congrats to me! I was thrilled on hearing the ‘shudhh hindi’ commentary after a long time, cannot recollect the last time when I watched any doordarshan (which has become pretty door from our tvs). The hindi commentator talking “Bhabishya ke garbh mein kya hai… ” etc on the opening ceremony. Honestly, none of us expected this guy after the hype & hooplah about Anjali Bhagwat,Mansher et all. Reading about Abhinav’s dad saying “Singh is King, Abhinav is king” was equally entertaining. Just wondering….Had Abhinav Bindra’s father been just a clerk in the central govt., would India be in the medal’s tally with 1 gold. It’s an open secret that he managed to achieve this feat not because of but in spite of the sports association. Congrats to Abhinav for this feat and a big thank you to his parents for allowing him to pursue his dreams. 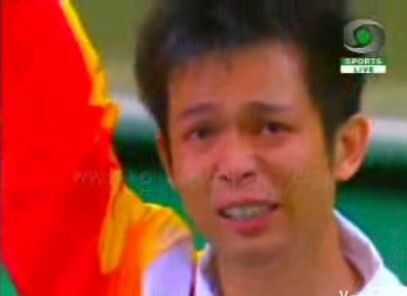 Zhu Qinan was crying cause he didn’t win gold. If the Indian, Bindra, had been in his place, i’m prety sure he would have been jumping around with joy. That, my friends, is the difference in standards. Bindra is an individual success, not something that the nation and the system needs to feel proud about. And GB, Phelps is competing in only 8 events and is trying to win 8 golds, not 9. I know its trivial, but facts are facts and you must get them right if you’re going to use them. The comment about a young man, roaming on the streets of beijing with the words ‘Mera baap ek Indian ke paas gold haara’….PRICELESS!!! Ek adad gold medal ki keemat tum kya jano Zhu Babu? Pitaji ki sponsorship ka aashirwaad hota hai, ek adad gold medal. Har gareeb state ke paiso ki barsaat hota hai, ek adad gold medal. Har 100 saalo mein desh ka khwaab hota hai, ek adad gold medal. I thought “xie xie” meant please / excuse me in Kwantanghua (Cantonese). I thought I picked up 2 Kwantanghua words from my travels there, “xie xie” & “mouaa”. Slight correction there, GB, I think the Finnish guy who came third needs to be thanked more than the Chinese. He and Bindra were tied at first place till the last round. Bindra held his nerve under supreme pressure (an Indian? You don’t say!) and shot the best score of the evening by ANY shooter (a 10.8 out of a maximum of 10.9) while the Finnish guy shot the first score by a shooter under finalists (so much for the Hakkinens and the Raikonnens being called the “Ice Men” of racing) – a 9.7. In fact this score was so bad that he came third instead of what should have at least been a silver. The Chinese guy shot a decent round to vault to silver. And yet, Bindra has achieved this only because he has family money. The last thing as prize he needs is money from various associations. Rather fund various “Abhinav Bindra School of XYZ” academies that teach any olympic sport (with the exclusion of T20, if it becomes one). That was really really funny, the rarity of losing gold to India. You are right that’s the last thing he expected…losing to India. btw when i saw the pics of the Indian contingent with Sania sans the sari…I had a feeling someone would bring it up.U did!! n i hope the Great Indian Babudom hasn’t got into this “indiscretion”. Many congratulations to Abhinav. And he sure does deserve all the praise in the world. His achievement is not hanks to any ‘official’ support. In light of the William Tell – Dispensable Maid story, I withdraw all my congratulatory messages I typed, until my fingers bled, on various message boards, including Bindra’s blog. Risking injury to the maid, so that the Bindra could show off is reprehensible and should be condemned by all. The fact that this is not an issue in the media speaks volumes about the Indian society. We truly are a selfish lot. The dus lakh rupees Maharashtra’s chief , Deshmukh, transferred to Bindra from the state’s treasury should be given to the poor maid who had to tolerate young frankenstein Bindra. You are the God of Sarcasm. Zhu zhu zhu, who remembers that song ? I am always surprised by the range of your knowledge ! What is this Ipod thing??? I see everyone asking ipod’s n all for commenting 1st, 2nd etc..? are you giving away Ipod’s? yes Vishesh….only the first one gets it…Ipod, that is. My entire village Panchayat has them now. It comes with assorted Bhojpuri classics from Greatbong’s personal collection. How come India’s first individual gold medal (and also first individual silver medal) was won by north indians ?? Looks like a conspiracy against south indians. Perhaps from next time, 80% of olympic berths should be reserved for south indians. Now every proud Indian parent would pursue their would-be Olympic gold-earning children to shoot at their maids, as if watching WWE was not enough! Oh! Tasteless. My mind that is. Is that some kind of special Olympics GB, held in Chandigarh? Is that where you won the gold medal in ‘shooting’? LOL. Splendid post. I liked the snapshot of the medals tally after that day. We were in the Top 10!! As the days pass however, it is a slow and inexorable march to the bottom of the list. But thanks to Abhinav for at least making us feature there in the first place. I cannot take part in this RGV contest as I don’t think that I have the required guts.I tried watching AAG alone but freaked out in 30 minutes. Seriously speaking, Akshay Kumar can have this (watching AAG alone) as the final stunt to decide the winner in Khatron Ke Khiladi. Come on guys this is awesome..cut out the sarcasm..this guy has single handedly done what the suresh kalmadis, gandhis ,nehrus ..etc have stopped us from doing in 100 years..he has broken the attempt to demoralise indians by our own politicos..
p.s Sidin’s link needs updating! “Mera baap Indian se gold haara”. Among all this brouhaha about AB we seem to have conveniently forgotten that this is also the first time that India has failed to qualify in hockey !!! By the way GB did you know that China’s first individual gold was also in shooting … in the 84 LA olympics … intersting trivia naa ??? Congrats to Abhinav! And thanks a lot too! Give the guy a break on the maid incident, he was 7 for heaven’s sake. Thanks to his dad for helping his son achieve his dream but am I the only one who is starting to get a bit irritated by his father’s pronouncements on TV? The reaction of the Indian public can only be compared to a particular scene in Caligula. If you have watched it you know what I am talking about…Crescendo! Thank You Arnab for making my day. Really brillant, great stuff, really funny. you rock. Abhinav’s father is idiot for saying that about maid. Well done to Bindra! Great achievement given all that he has gone through especially on the injuries front. Having said that, I am surprised there has not been much hue and cry over the fact that the sight of his rifle was tampered with during the break when he and his coach had stepped out of the range. So much so that he shot a 4 when he tested the rifle on coming back & had to spend most of the time left in setting the sight right rather than preparing himself mentally for the final round. a) Apparently, only someone from the Indian support team contingent would have been able to get close to the rifle! If that is true, I wonder what drives whoever it is that did this. Why would you want to deprive someone from your country of the chance to gain Olympic glory? b) On the other hand, imagine if this had happened to a foreign shooter in an Indian range – all hell would have broken loose about how India is not fit to host a world class event etc etc. I am surprised even Indians have not raised a hue and cry on this front. Would it have been the same had Abhinav failed to win a medal? Ohhhh………u make me nostalgic dude….Caligula…reminds me of mah hostel days……hw can i forget? lucky chap…fame , money and billion admirers…i am so jealous..LOL. I think the shooting vooting thing is easier than cracking the competitive exams. can the sharp shooters also participate in this game???? in dat case may be we can confer Indian nationality on some pro-firang and make him participate in the next olympics…..wat say??? Poochandi – I, too, grew up in an upper middle class home, and I, too, was 7 once. But I never mistreated those wretched people whose sole purpose in life is to serve India’s baba log. To be honest, I am frustrated with the media and the great Indian middle class who, by not condemning the maid’s exploitation, once could argue, have even legitimized it. And, btw, I am no “bleeding heart Lefty”, anything but. Even if everybody in your hostel watched that movie, it would not be more than the number of “participants” in the movie. I suppose there was a horse there too, but the details are too hazy for me! You are all going Renuka Chowdhary on a 7 year old kid. The Tell incident is a stupid act by a kid and not a mistreatment. Mistreatment is something like the US PI couple did. Dude you are funny! Enjoyed the post..
Just a point I need to make. The Tell incident *is* a stupid act by a kid. True. However it does say something disturbing about the the feudalism that still remains in very affluent families. It also attests to the haplessness of hired help when working in a house where they are being, possibly, paid a lot of money. Forget the kid here…it is true he knew nothing about the implication of his actions. But what about the maid servant, who definitely knew the implication of her actions. The fact that she went ahead with this whole thing, rather than refuse, just points to her helplessness driven no doubt by the fact that she was being well-paid and could not afford to lose her job and knew that even saying no to a seven year old kid was cause enough for termination. Isnt there some sort of “mistreatment” here? Whats even more amazing is that so many years hence, Mr. Bindra would repeat this incident to reporters not even realizing that this reflected rather poorly on him and the family in general. Which shows that he still, even 20 years after the incident, just does not “get it”. Is there ANYTHING we can do to loosen the grip of greedy officials and corrupt politicians on Indian sports? Or are we condemned to simply crib, complain, mock and wait for the next outrage so we can repeat the ccm cycle? And Arnab wins the gold for RIPPING people apart and making the audience laugh right off their chairs while he’s at it. IMHO a seven year old has better sense than to shoot a bottle of someone’s head whether it is a maid or a dog. The maid may be to blame partially for consenting to it. heck, when I was seven…..I was taking care of my younger sibling, doing light chores around the household and perhaps a little too mature for my age. of course I grew up in a lower middle class environment where my both my parents worked hard (full time jobs) to provide to us and the extended family who were constantly around at some pretext or the other…. Just another perspective…….now that Prince Abhinav has won gold here comes the dowry procession!! Now that Bindra has won a gold he should be allowed to target practice at Kalmadi and Karat. Yes, Bindra senior is totally clueless about socially correct remarks. Feudal,very. Hey – Zhu Qinan happened to get silver just cos Henri Hakkinen screwed up the last shot and slipped from joint 1st to 3rd. Else Zhu zhu zhu would’ve been 3rd, no? So we should thank Hakkinen instead, and so should Zhu. zhu zhu zhu … was brilliant!!! Kudos 2 GB for making such a wonderful observation 2 poochandi’s response…..